Some of the medicinal benefits of Aloe Vera are mucilaginous compounds that soothe inflamed tissues, absorb toxins, give bulk to the stool and promote the growth of friendly colonic bacteria. It has been used to treat burns, ulcers, inflammatory skin conditions, hemorrhoids and constipation. This ancient medicinal plant is said to have been part of Cleopatra's beauty regimen, and today many cosmetic creams and lotions contain the soothing and astringent aloe. the sap of the aloe is an excellent first-aid remedy for minor burns and infections. Aloe Vera looks like a succulent but is actually a member of the daylily family. A crown of fleshy leaves grows on the end of its short stem, which reaches a length of about 24 inches. when you eat its leaves, you will find a bitter-tasting juice and a soothing gel. The leaf is sliced open and bitter green outer portion is removed . The liquid gel is collected. Aloe originated in eastern and southern Africa. From there it migrated to America. today it is primarily grown in the subtropical areas of the United States and in the West Indies. What makes Aloe Vera so unique is that it makes an excellent house plant to keep on hand in case of emergencies, like burns or skin irritations. Nature Sunshine Products are the only Herbal and Vitamin Supplements that I have used for myself and my family for over 10 years now. I became a distributor of Nature Sunshine Products because of their products high quality, customer support and educational commitment to their customers. I highly recommend the company and their products as being safe, clean, dependable and fair pricing to their members. Try Nature Sunshine Aloe Juice! 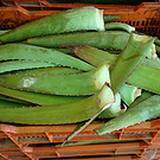 The leaves of Aloe Vera contain the plant's medicinal substances. In fact, a bitter liquid from the base of the leaves is boiled and dried to produce the base material for a drug called aloe. Aloe Vera Gel from broken-off leaves can be used directly on the skin; extracted from the insides of the leaves, it is available commercially. A popular benefit of Aloe Vera is that you can take aloe internally as a laxative. It's commonly found in over-the-counter laxatives, as it stimulates intestinal activity. 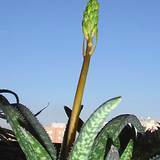 Plus, if your appetite has waned, aloe tincture can stimulate it. A benefit of Aloe Vera Gel is that you can apply it externally to promote regeneration of the skin and speed healing of minor wounds. It inhibits inflammation, stops minor bleeding and helps cure eczema, sunburn and minor burns. Finally, Aloe Vera moistures dry, sensitive skin. Caution!Never use Aloe Vera as a laxative for more than 1-2 weeks without consulting your physician. Overuse of any laxative can cause a potassium deficiency . 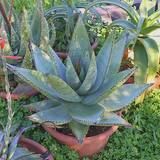 Aloe Vera leaves are not available in stores, but the plants are very easy to grow. You can find them at any garden center, and you'll be able t use the leaves as needed. 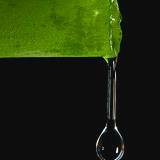 Cut or break open a fresh aloe leaf and obtain the gel. Apply it to skin irritations, such as minor burns, cuts, or areas with eczema. Aloe Vera Juice, obtained by cold-pressing the entire leaf or just the gel, acts as a laxative; it is milder than the compounds found in the whole aloe leaf. The benefits of Aloe Vera Juice is to help maintain colon health and to ease peptic ulcers and irritable bowel syndrome. 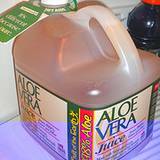 Aloe Vera Juice and extracts are available in health -food stores. 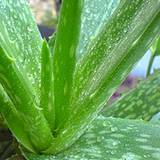 aloe is a favorite moisturizing ingredient in natural skin-care products. Suppositories, laxatives and the taste-enhancing coating on many types of pills often contain aloe. Potencies greater than 4X are used for both internal and external treatments. Nature Sunshine Aloe Juice is Top Quality!